The news that EA has locked down the rights to Star Wars games has, understandably, been met with a fair amount of backlash. Electronic Arts is far from people's most trusted and beloved publisher of video games, and fans are worried this will somehow be bad news for the future of Star Wars video games. But is it all bad? Not at all. In some ways it's the best outcome we could have hoped for in, given the realities of big business, a fairly awful (read: lesser of two evils) situation. Here's why. Disney was never going to break this up. As the owners of Star Wars, Disney was never going to offer the rights off individually to various publishers on a per game basis. It was only ever going to sign a bulk deal like this, lock somebody in for the long haul, and given the popularity of Star Wars, only a handful of publishers would have been able to afford it. Maybe even two. The other being Activision. Would you have preferred that? These are good teams. EA is a terrible publisher, and for the most part, I'll agree with people who mistrust them and straight up dislike them. But at the same time, the specific studios named to be working on Star Wars games today have some of the best track records in the business in spite of that. There could be a lot worse developers out there working on new Star Wars games than the companies behind the various Battlefield games and Dead Space. Indeed, put it that way and it almost seems like a best-case scenario. Almost. Think about those studios. They have specialities. If DICE don't end up making some kind of Battlefront replacement, using their Battlefield experience, I'd be very surprised. Or, if not that, then at least a decent shooter from the Bad Company team. Ditto for Visceral; we've had loads of quality Star Wars games over the years, but a quality survival horror experience hasn't been one of them. The benefit of the deal being such a big one looks to me like Disney is seeking to cover multiple bases with multiple projects catering to different genres and markets. So we'll get a shooter, yes, but other games like RPGs and horror games as well, hopefully. It's not like Star Wars games have been setting people's pants on fire lately. When was the last time you played a truly great Star Wars game? Force Unleashed was OK. Republic Commando was pretty good. Before that, well. It's been a very long time. 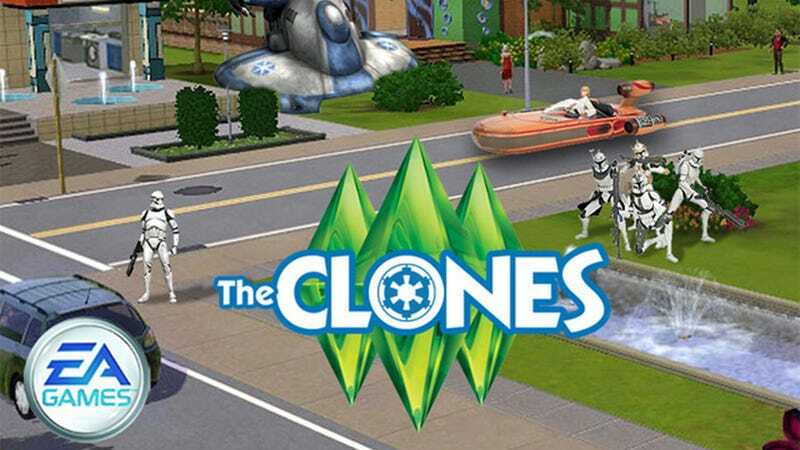 How is EA getting the rights to these games any worse than the situation we had previously, where Lucasarts sat on the license and either farmed it out for shovelware or released shoddy sequels? These aren't kids games. They're not Facebook games. Disney will be handling the lighter stuff on their own. This deal is specifically for "core" games, the kind you'll play on an Xbox, a PlayStation or PC. Since that's a section of the market Lucasarts mostly ignored over the last decade - and since it's likely the section of the market you belong to - that's good to hear. Of course, I'm a hopeless optimist. I always hear about deals like this and hope for the best because, well, that's how my mother raised me. I'll grant you, though, that there are also potential pitfalls ahead. DRM. Always-online. DLC. Rushed annual releases. Ceaseless microtransactions. In-game advertising. You know, the bad stuff people associate EA with. The company has surely learned valuable lessons from recent disasters surrounding SimCity and Medal of Honor, but you can never be sure. If we start seeing Lightsabers® powered by Energizer™, it's time to bail. BioWare. Five years ago, news BioWare were working on a new Star Wars game would have made fans go bananas. But the BioWare of 2013 isn't the BioWare of Knights of the Old Republic. The company is spread - perhaps too thinly - over multiple teams, all of which have had a few black marks against their name lately, from Mass Effect 3's ending to Dragon Age 2's step backwards to Old Republic's colossal waste of resources. That makes going bananas a less immediate inclination. Movies. It's easy to get carried away and start hoping for strong new takes on the Star Wars universe, or true continuations of series like KOTOR, but at the same time, there are new Star Wars movies coming. Lots of them. For every decent/good/awesome game we get, we're just as likely to get a movie tie-in. Call me naive, call me a hopeless optimist, but as someone who's played a ton of Battlefield and Dead Space over the last few years, and who has yearned for someone to stand up and start making serious Star Wars games again in the absence of any real drive or ambition from Lucasarts, I'm quietly pleased - if not ecstatic - with today's news.